For Canada orders, please call 605 335-4125 for shipping ratesWe ship world wide, Contact candleschimescrafts@hotmail.com for shipping quote. angel chimes, chimes candles and related, order page. Free Shipping Extended, Standard U.S.P.O. Note: To get quantity discounts when mixing colors or finishes, please order by telephone 605 335-4125, 24 hours 7 days. Also for store owners, wholesale etc. Slightly smaller and lighter material. Made in China. Boxes of 20, Color Replacement Candles, 1/2" diameter by 4" tall. Bright Party Candles, 10 Assorted Colors, 2 of each color, 1/2" diameter by 4" tall. Total of 20 per box. Colors include: white, red, blue, light blue, green,yellow, orange, pink, purple, and ivory. Special Metallic Anniversary Candles,half by 4in. Pyramid candles for Christmas Windmills. Silver Menorah, Tree Design 5".5 x 5.5"
Holder for half in. Diameter Candles. For half in. diameter candles. 1" x 1". Holds 1/2" diameter candles. Holds 4 of the 1/2 in. diameter candles. 5/8" x 4", Candles for Pyramids or Windmills. 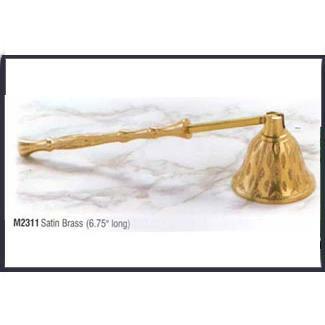 Satin Brass Candle Snuffer, 6 3/4" long.